QUITMAN, Tx. -- Things have been a bit on the gloomy side recently in my home state of Texas. Like the rest of the country, the economy struggles a bit. And if that's not enough, the state is trying to put into its rearview mirror a summer from Hades. Triple digit heat has seared the countryside, drying up lakes and ponds, killing trees and vegetation and taxing wildlife to the limits. And for months, as the rainfall deficits increase, massive and deadly wildfires have quite literally scorched the earth from one end of the Lone Star State to the other. Still, Tuesday, Sept. 6, 2011, I felt like celebrating. First, the day itself marked the fifth anniversary of unexpected open-heart surgery at the ripe old age of 40. Despite my 5-foot, 10-inch, 180-pound frame - and being in the best shape of my life as I ran and prepared for a Utah elk bowhunt that never happened - doctors had fortunately discovered in 2006 that I was a ticking time-bomb about to explode. So under the knife I went for several bypasses, semi-young man or not. To celebrate the past five years of additional life and blessings I've enjoyed from the Creator, I was going to get outdoors on this day and spend time enjoying life. And secondly, I was going to deliciously soak in the first big cool front of the autumn season in Texas. After months of 100-plus-degree heat, it was pure joy to actually shiver in the early dawn as I raced across Lake Fork in the bass rig of my good friend Chris Bobo. To be truthful, I wasn't sure what kind of day we were going to have. After all, a gale from the north had blown for the previous two days. And it had been weeks since either one of us had been on Fork's famous water. But none of that mattered as we pulled up into the first spot of the day and alternated between buzzbaits and topwater plugs as the pre-dawn glow gave way to actual sunlight. Just one problem: there were no takers. Next came a crankbait assault on the usually bass filled creek channel that we were plying. Again, despite the ample presence of shad, nothing doing. Unless you call a hungry white bass a successful catch on a bass-only outing. After an hour of flogging the water without a catch, Chris suggested that we pull back out into the main lake and see the actual relevance of some Intel that he had received a few days previously. So we roared south with me smiling at the day itself but wondering if it had any fish to offer us. Moments after we pulled up onto our next spot, a mix of underwater structure and visible cover, it did. And then some, I might add. From that point forward, to say that we had a great day of bass fishing on Lake Fork would be an understatement. Of Texas sized proportions, no less. First, Chris started things off hooking, fighting and ultimately losing a fish at the boat that we estimated in the eight- to nine-pound range. Later, he lost another bass that was about the same size. And finally, he was unable to successfully land a behemoth weighing 10 pounds or better that actually struck his lure at the boat. Bottom line, he's a great fisherman who just had an unlucky day. Meanwhile, somewhere in that mix, I landed a bucketmouth bass weighing 9.52 pounds on a Tennessee Shad colored DD-22 crankbait. That fish marked the biggest bass I had ever successfully brought to the boat. Because about 45 minutes later, another giant bucketmouth roared up from the deeps and chased my Baby Bass hued DD-22 bait to the surface where she absolutely smashed it. Somehow, I hooked the fish and stayed tight. After a brutal battle, this big gal tipped the scales at an amazing 9.85 pounds. 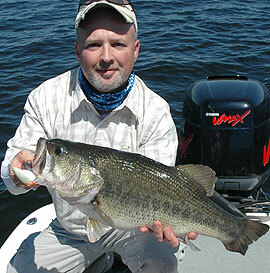 Burkhead's third Texas-size bass of the day tipped the scales to 8.10 pounds. Yet another new personal best. And believe it or not, less than an hour after that, I felt a strike, grunted and buried the hooks of my Clown colored DD-22 into yet another big Lake Fork bass. Amazingly, this one loaded the scales up with 8.10 pounds. Amidst this entire piscatorial hubbub, all three big bass were CPR-ed (caught, photographed, weighed, measured and released). When this amazing big fish run was finally over, all I could do was to sit down, tremble and smile at the bucketmouth bass blessings that had been sent my way. Because the bottom line here is that unlike my partner, I was nothing more than a not-so-great fisherman/writer who had a very lucky day. For what it's worth, in addition to those three toads, I also lost a sizable bass that we estimated in the seven-pound range. But, I couldn't complain. Because how could anyone grumble after landing three great bass weighing nearly 30 pounds combined, all caught on a special day of personal celebration and heartfelt gratitude? On a lake well known for its big bass, this cool day in September was an epic day of fishing. A special day of angling adventure that I will never forget. Even deep in the heart of big bass Texas.